You may not realize it, but Pennsylvania is an important center of artistic expression and creative energy. All the arts, ranging from dance and theater to music and especially the visual arts, thrive in Pennsylvania—and its Southeastern Region in particular. With easy access to New York, Baltimore, and DC, Southeastern Pennsylvania has it all, including some of the top digital media programs in the country. If you’re looking for an education in digital media that combines the faculty, curriculum, resources, and experiences that will prepare you for an amazing job, and more importantly an amazing career, you need to ask the right questions in order to find the right program. You may feel like there are countless schools shouting from the rooftop why you should enroll in their digital media programs and what makes each one of them such a great place. All that noise can be overwhelming—especially when you’re not sure what information you really need to help make a decision. So let’s talk about the things you actually need to know about choosing a digital media school in the Philadelphia Region. Ready, set, go! Digital media schools offer students the latest technologies and tools. But you also need to look for a learning experience that takes you beyond simply Photoshop and After Effects. In order to be a successful artist, motion graphics or interface or game designer, digital media specialist, producer, animator or whatever you choose, you also need to study ideas. 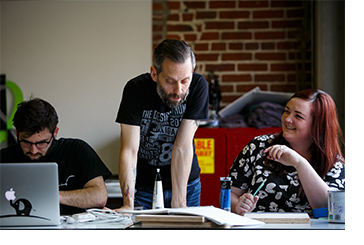 You’ll want to complement your studio and technical studies with a well-rounded academic education. Colleges call this “liberal arts” and it is just as critical for a successful college experience, and more importantly, for your life after college. There’s no need to brag about how many students attend a given school. The goal is to find an education that’s worth bragging about—not the size of the program. Look for digital media schools that feature small classes. Small classes ensure that you won’t need binoculars in the back row of a huge lecture hall because…well, there isn’t a huge lecture hall. Of course, you should expect that some intro courses may have larger class sizes, but once focus narrows in your major, you’ll really benefit from the added attention your professors are able to give you. Small classes also mean it’s easier to forge a relationship with your professor, who could become your mentor. It’s this type of connectedness that can help with securing exceptional internships, building professional networks, and finding the best first jobs as you begin your career. Cutting-edge digital media programs should offer a ton of creative resources and options that you can’t find elsewhere. Digital media programs that are in top art schools have amazing resources for their students and offer environments that support, not limit, their students’ creative potential. You’ll want to look for digital media programs that are taught by faculty who are experienced, working professionals. Faculty who, as artists, bring their knowledge and current professional practices into your classroom every day. When you are surrounded by a community that’s driven by creativity every day, month, and year, it jump starts your imagination 24/7. You may already know that digital media programs can provide you with high-end tools and technologies. But how do they help you focus on your work? At traditional colleges, where art students are typically surrounded by many students with a range of interests and majors, it may be hard to focus on your passion. At an art college as a digital media major, you’ll find your classmates are just as passionate about art, the creative process, and succeeding as you are. Sharing the same dreams and goals leads to natural camaraderie and collaboration. And, your faculty, who are also passionate about the arts, will help keep you headed in the right direction. As professional artists and designers, they know how to focus your talents to get you ready for the professional world ahead. If you’re serious about a career as an artist and designer, you’ll need to find a digital media program that supports your professional preparation through required internships and working apprenticeships. It’s these mentorship opportunities that will give you real world experience as you learn first-hand what working in a creative career is really like. From deadlines to client relationships, the experience that you will gain translates to added confidence and provides demonstarted success for the job market after college. Look for programs with these kinds of experiences and ask how that translates into finding that first professional job after graduation. How many graduates are working in the field within a year of graduation? Deciding if there’s a digital media school in the Philly region that is right for you is not an easy task. But we’ve just covered five things that can help lead you to the right choice for your higher education. Above all, make sure you choose the school that fits your personal and creative needs. Finding the right fit for your personal goals and career aspirations is the key to your career and life in art.